Nearly a year after a landmark peace was reached in Colombia, the European Union on Monday removed the Revolutionary Armed Forces of Colombia (FARC) from its official list of terrorist groups. FARC, which battled the government for half a century in a conflict that left some 260,000 people dead, reached a historic peace deal last year and its former leader now plans to run for president. The decision to remove FARC from the list permanently comes after the EU suspended its terror listing in September 2016 in a bid to help the peace process in Colombia. "The Council adopted the legal acts providing for the de-listing of the FARC from the EU list of individuals and entities subject to restrictive measures to combat terrorism," an EU official told AFP, adding that the decision would be announced officially on Tuesday. After agreeing to the peace deal and disarming, the rebels transformed their movement into a political party, keeping the same initials but changing the official name to the Common Alternative Revolutionary Force. Rodrigo Londono, 58, the group's guerilla leader better known by his nickname "Timochenko," will run in the presidential election for the party, with the first round of voting scheduled for May 2018. The U.N. has heard of concerns about progress under the peace deal. There are warnings that the reintegration of former fighters is not progressing well, with many finding it difficult to return to civilian life. FARC's demobilization has also triggered battles over territory it used to control, the Organization of American States warned last week, particularly areas linked to the drug trade. The group has been on the EU list of terrorist groups since 2012, other than September 2016, when it was temporarily removed from the list. On Nov. 24, 2016, Colombia's government signed a peace deal with the country's largest armed guerrilla group, ending 52 years of civil war. This June, FARC finally laid down their arms after a decadeslong conflict that killed more than 260,000 victims and displaced 7 million others. 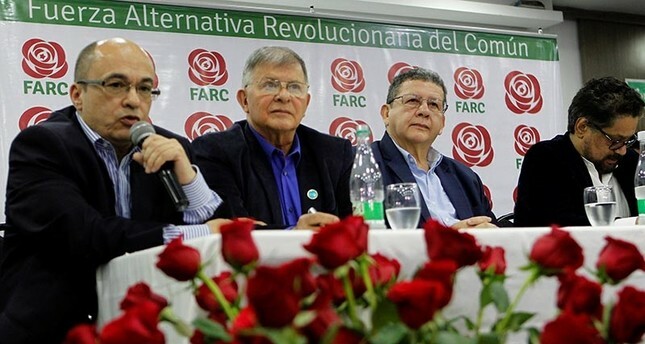 Under the accord, FARC will receive five seats each in the Senate and Congress in the Colombian elections scheduled for next March, thus cementing the group's evolution from a military to a political force.